Umcka Elderberry Syrup / 4 oz. - Nature's Way®. Products /Umcka Elderberry Syrup / 4 oz. Umcka Elderberry Syrup / 4 oz. You can feel confident knowing that Umcka (Pelargonium sidoides 1X) is proven effective in clinical studies for alleviating common colds plus nasal, throat, and bronchial irritations. Clinically tested Umcka (Pelargonium sidoides 1X) plus Sambucus 3X & Alpha® CF combined into one complete, multi-action cold and flu formula. Umcka shortens duration and reduces severity of common cold, nasal, throat, and bronchial irritations. For best results, use at first sign of symptoms. Continue to use for an additional 48 hours after symptoms cease. Use only with enclosed dosage cup. Adults & children 12 years of age and older: Take 1 1/2 teaspoons (tsp) (7.5 mL) three times daily. Children 6-11 years of age: Take 1 teaspoon (5 mL) two times daily. ††These indications are based solely on traditional homeopathic use. They have not been evaluated by the Food & Drug Administration. Sore throat warning: severe or persistent sore throat for more than 2 days or if accompanied by high fever, headache, nausea, vomiting, or rash may be serious. Consult a physician promptly. If pregnant or breast-feeding, ask a healthcare professional before use. Keep out of reach of children. In case of overdose, seek medical help or contact a Poison Control Center right away. Umcka® Cold+Flu chewables are clinically proven to relieve symptoms and reduce the severity of common cold and flu symptoms such as fever, minor aches and pains, congestion, runny nose, sore throat, and cough. And they taste great too! 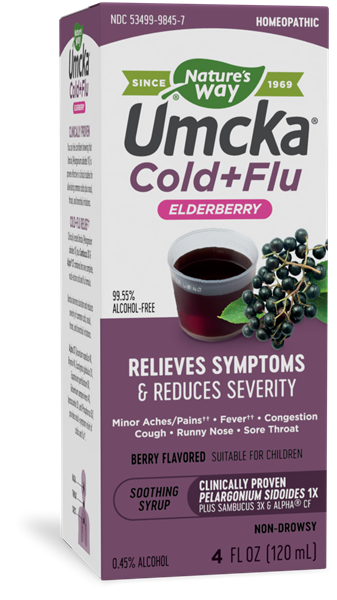 Umcka Cold+Flu Berry Syrup / 4 oz. Umcka Cold+Flu Orange Syrup / 4 oz.